I'm a carb craver. I've been trying to eat healthier but can't kick my pasta desires. 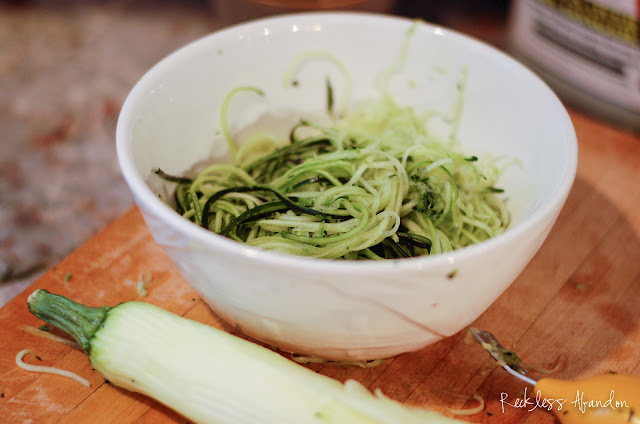 Long, delicate strips of zucchini twirled with whole wheat pasta makes this a lighter, yet still filling, substantial dish. It's tossed in a sesame dressing and paired with sesame and wasabi crusted ahi tuna for a fresh and healthy dose of protein. 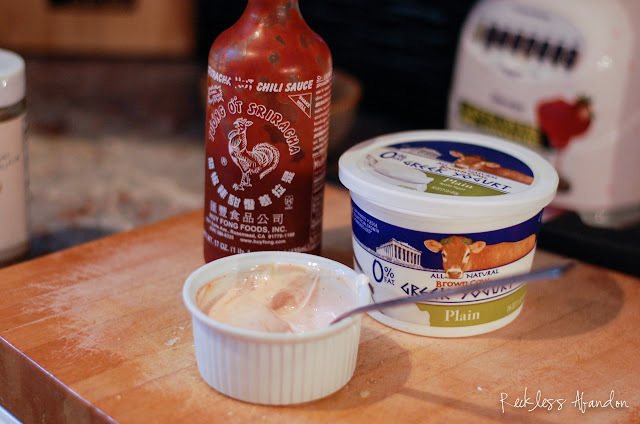 If you want a bit of a heat drizzled on top, stir together greek yogurt and Sriracha for a leaner Asian "spicy mayo". 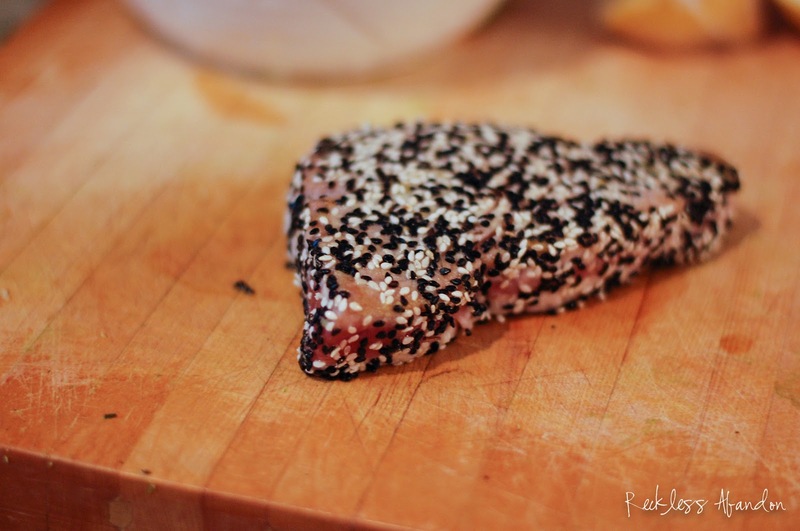 The blend of wonderful textures and fresh fish make this the perfect summer meal. 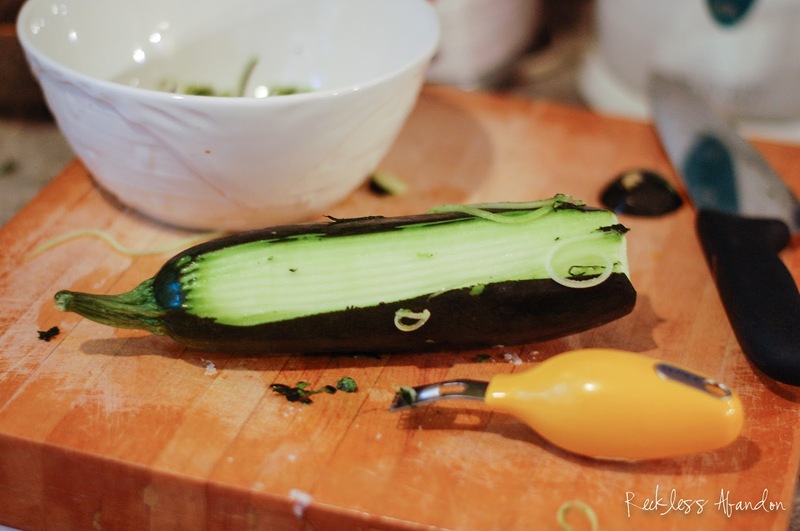 The only utensil you may not have is a "zester" to create the thin strips of vegetables. I purchased mine from Crate and Barrel for only a few dollars but I assume it can also be found at Target, Sur La Table or William Sonoma. You can see mine in a picture below. 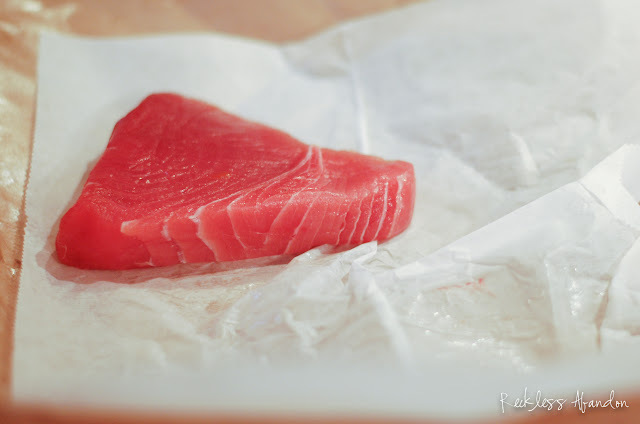 Where to buy fresh, sushi-grade ahi tuna? My favorite seafood spot is Chef's Fresh Fish... overnight delivered to your door. 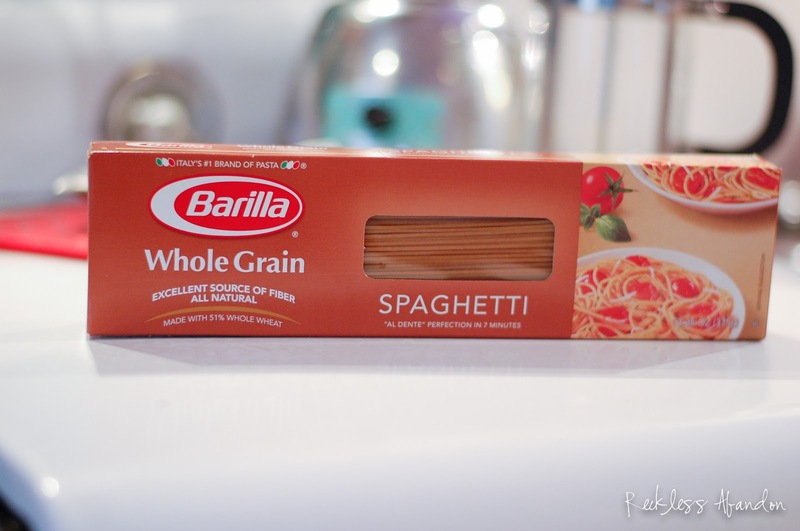 Boil the pasta water and cook the 1/2 package of whole wheat pasta according to the package directions, drain and place back in the pot. 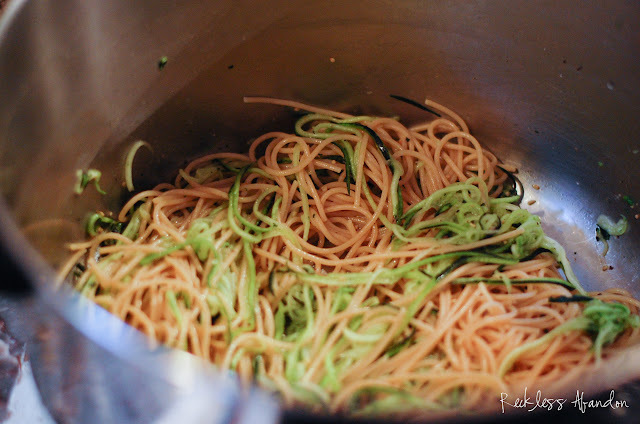 You can add the zucchini pasta at this time to the pot of pasta as well. 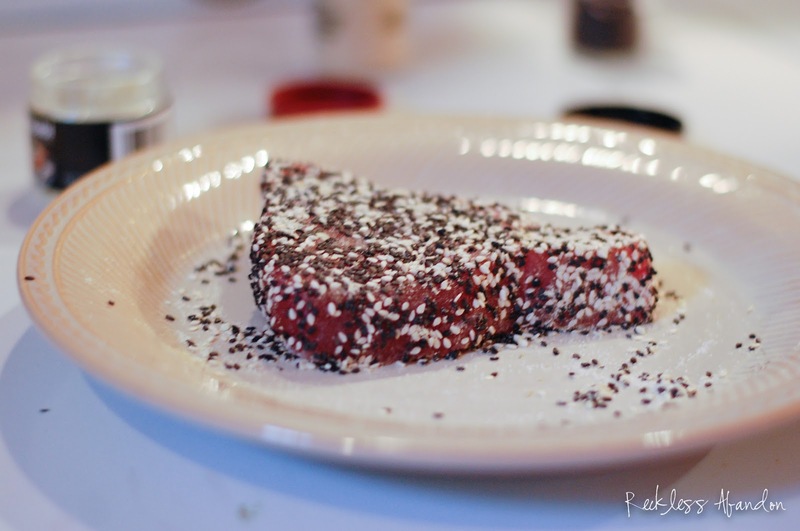 Drizzle with 3 Tbsp toasted sesame oil and 1 Tbsp rice vinegar. 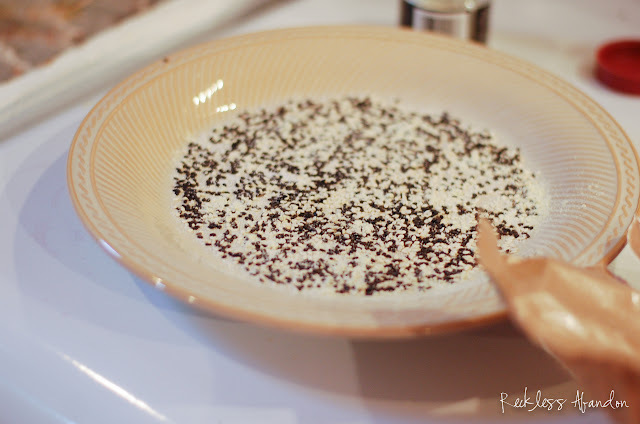 Stir to incorporate and salt and pepper to taste. 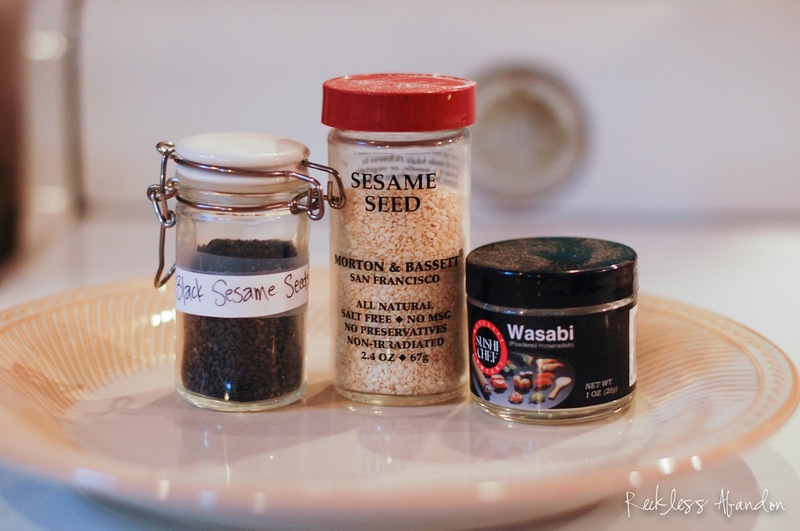 I also added a sprinkle of Eden Organic's Seaweed Gomasio (Asian seasoning blend of sesame seeds, seaweed and sea salt — can be found at Whole Foods when you getting your fish). While the pasta is boiling you can coat your tuna in its crust. Basically, on a wide-bottom plate, evenly sprinkle the 3-4 Tbsp sesame seeds and 2 tsp wasabi powder to cover the bottom. Coat both sides of the fish in the seasonings and if there is any extra use your fingers to press it to the side of the fish fillet. 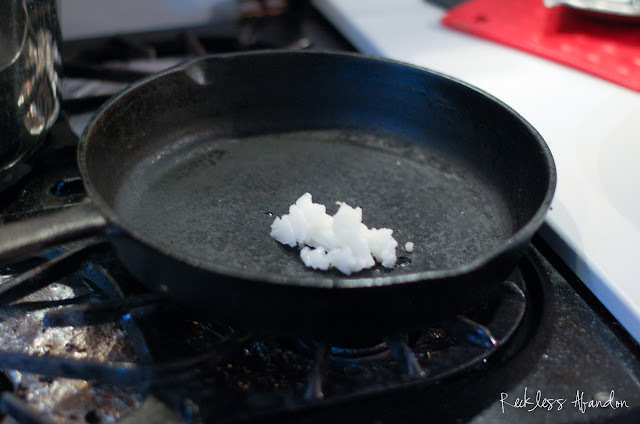 In a medium skillet, heat the 1 Tbsp coconut (or vegetable) oil over high heat. 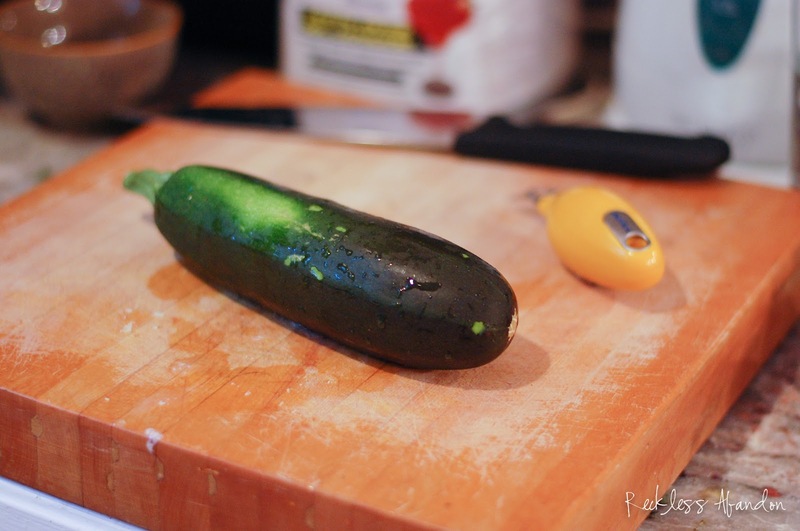 Wait a few minutes until the oil is really hot. You can test this by flicking some water onto the oil to see if it pops. 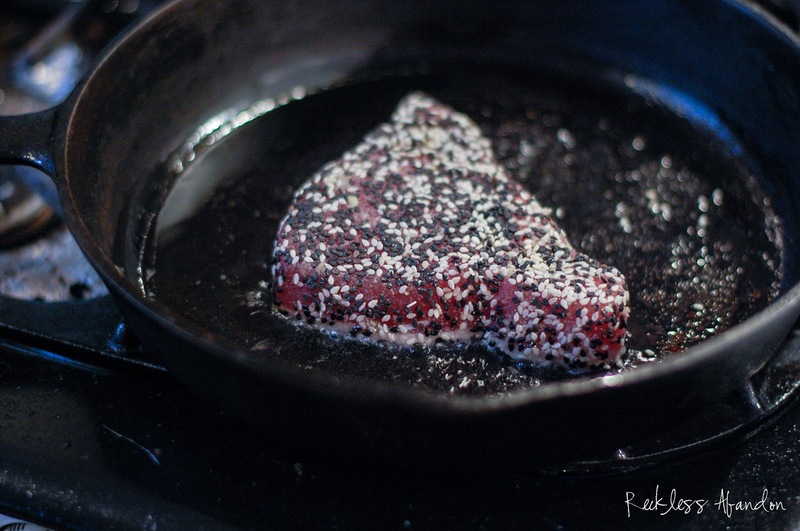 Sear each side of the tuna for only 90 seconds per side. 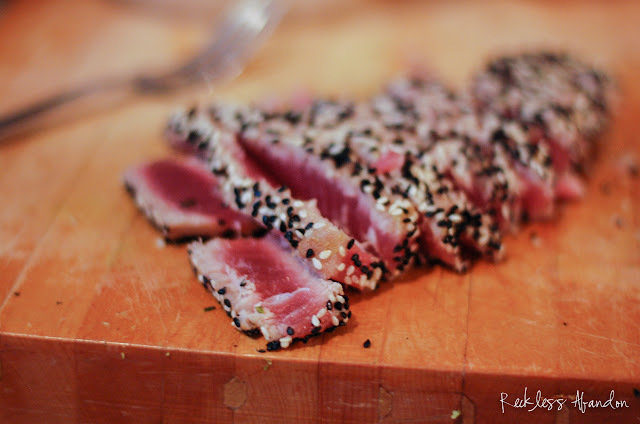 This will leave the tuna rare in the middle, just the way I like it (and the way I think tuna should be served). 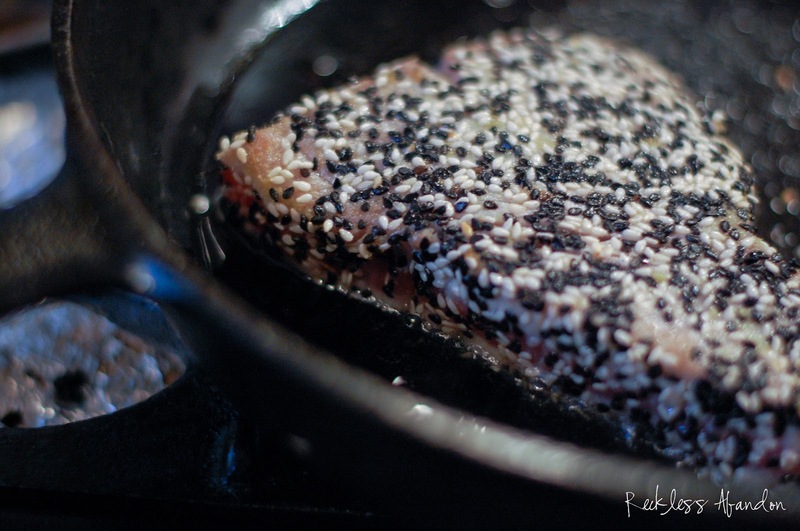 You can cook the tuna longer if you like, but remember it will get tough and you spent the money to get "sear-grade" tuna. 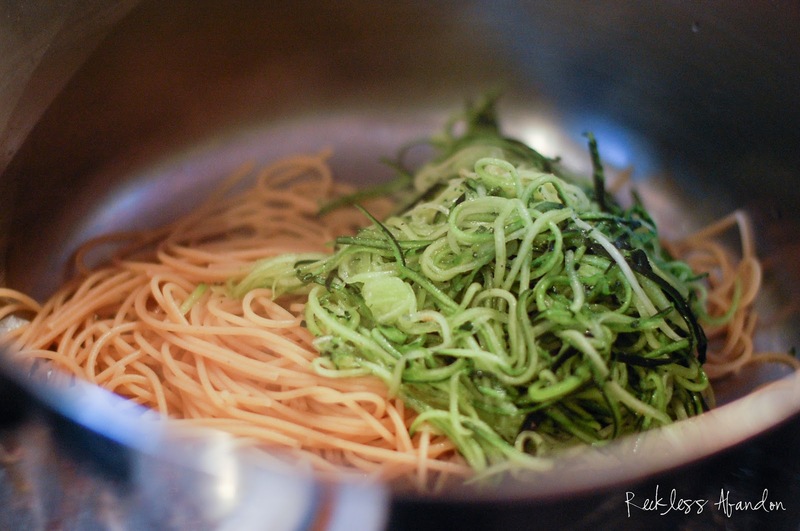 While the fish is searing you can stir together the 1/8 cup greek yogurt and 1-3 Tbsp Sriracha. I would start by adding a little and trying it until you get to your preferred heat level. 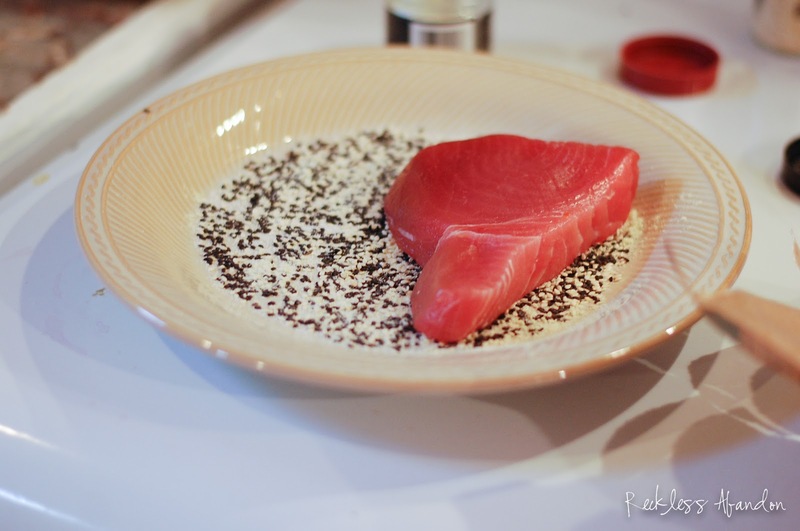 Thinly slice the seared tuna. To plate the meal, put a swirl of the zucchini and whole wheat pasta at the bottom of a wide bowl or plate. 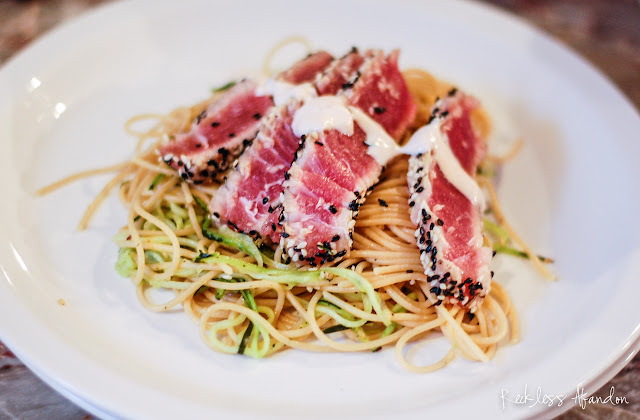 Fan out a few pieces of tuna on top of the pasta and drizzle with the spicy sauce. Enjoy your healthy, light, and fresh summer meal!